Effective as of 2013, banks are required to establish the source of funds for any transaction performed by a public servant and exceeding 15,000 rubles (about $500). Tougher banking controls have been imposed on all property transactions performed by Russian government officials, including the president and the prime minister. If any such transactions are identified as bearing a high money-laundering risk, credit institutions are required to take a number of steps, such as identifying the source of the property in question. Previously, only foreigners were subject to special controls. The amendments have been introduced into the law "On Combating Legalization (Laundering) of Criminally Derived Proceeds and Financing of Terrorism." The changes were required because of the law being adopted on monitoring, which now checks to make sure civil servants’ expenditures match their incomes. The law was signed by the president in early December 2012 and came into force on January 1, 2013. 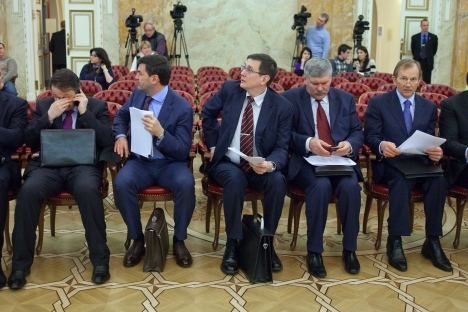 According to the amendments, the blacklist now incorporates Russian Federation government officials, including, in addition to the president and the prime minister, parliamentary deputies and senators, Audit Chamber auditors, judges of the Supreme and Constitutional courts, and heads of certain agencies, such as the Prosecutor General’s Office, the Central Bank, the Central Election Commission, and so on. The list also includes Central Bank Board members, persons appointed to posts in state-owned corporations determined by the president, and representatives of public international organizations. These persons are subject to special controls by banks and other institutions (including insurance and leasing companies, consumer cooperatives, pawnbrokers, and betting offices) when they perform transactions involving cash or property. Persons on the list are only exempt from the controls if the sum of their transaction does not exceed 15,000 rubles ($495) and is related to the purchase or sale of foreign currency or to the completion of a money transfer without opening an account. The changes could affect bank clients who are not even on the list, according to the head of Stroikredit bank’s financial monitoring department, Oxana Kurganova. She says that, by Western practices, identifying persons on such lists is only required when a contract relationship is established between a bank and a client (such as when an account is opened). Under the new law, Russian banks will have to do this even for one-time transactions exceeding 15,000 rubles. “For instance, a person comes to a bank to pay utility bills for several months; the bank will have to check if the person belongs to this category. In turn, clients may be wondering why banks try to establish such things to perform basic operations,” Kurganova said. Experts believe that inclusion of Russian government officials on this list will not lead to tangible progress in fighting legalization of criminally-derived proceeds. “It will be just as difficult to track down a multi-layer ownership of a limited liability company,” said Vadim Tikhonov, an analyst with the National Rating Agency. “Plus, even now, nobody really brings undeclared wads of cash in a suitcase to transfer to an off-shore account set up in that person’s own name.” Tikhonov believes it would make sense to “deepen” the blacklist by including lower-rank government positions. That being said, the law on control of public servants’ spending – which triggered the anti-laundering amendments – already concerns a huge number of officials and their family members. United Russia’s Duma leader Vladimir Vasilyev said last year that some 10 million people would have to report their expenses. For instance, the Federal Customs Service released a list of its employees subject to the law in mid-January: the alphabetical list includes more than 120 positions and starts with boatswain and flight mechanic (presumably crew members of customs vessels and aircraft). The head of Russia’s Federal Customs Service shared the list with chief engineers, technicians and advisers.